Let’s be honest, online inspirational quotes are a dime a dozen, and you’ve already heard plenty. Sayings like “Be confident. Be happy. Be you.” don’t inspire us anymore. Why not? Because they are worn-out clichés offering no real incentive to get up and do something creative. 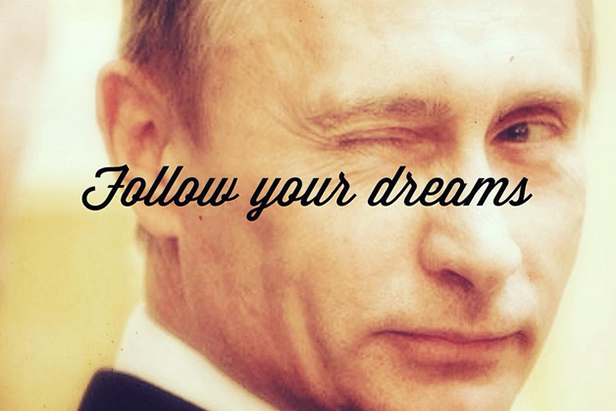 But we found a new Instagram account with only 15 photos so far, but each is a masterpiece of irony and wisdom based on a photo of Vladimir Putin. This Instagram had zero followers on August 31, but its audience is growing fast. Wise words and Putin pics are the secret behind it. Don’t dither! Join up and start tagging all your friends. Number of the week: How much does Vladimir Putin earn? Instaweek: What does Russia have except Putin and oil?